Thank you for visiting our website. We hope that these pages will give you an understanding of who we are as a church, as well as, what we are as a religion. We also have much information about what is happening at the church to keep our members, friends and visitors informed. We are a welcoming congregation that is a spiritual home to all people regardless of race, color, gender, affectional or sexual orientation, gender identity or expression, age, national origin, socioeconomic status, physical or mental ability. This is a three minute video describing Unitarian Universalism. Please follow the link below to watch. Sundays are the busiest day of the week at our church. Sunday Services will start at 10:00 year-round. We are located at 206 North Main Street, Underwood, MN 56586. Be sure to check out our Sundays page, where you will find information about everything that happens on Sunday at the Unitarian Church of Underwood, including the speaker for each week. The link is at the top of this page. We are glad you are here! When you attend the Unitarian Church of Underwood, please sit wherever you are comfortable in the sanctuary. We invite you to join us for treats during our social time in the lower level of the church following the service. Very often the conversation from the sanctuary continues during our social time. Although we also use that time to get to know one another and to simply visit. 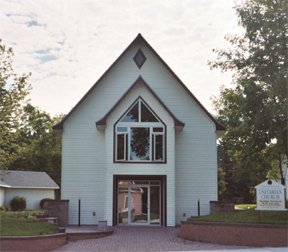 There is more information available in the front entry about the Unitarian Church of Underwood and Unitarian Universalism. If you have any questions, you can ask JoAnn, our Administrative Consultant, or that day's greeters. For more information about Sundays at our church, including the information about the speaker for each week's Sunday Service, you can click on the heading Sundays at the top of this page. Dress at our church is always eclectic and informal. Dress comfortably and come as you are. If you are comfortable with jeans in the winter and shorts in the summer then feel free to wear them. We don't have air conditioning so you may want to take that into consideration during the hot summer months. Likewise, it can sometimes be cool in the winter. This is largely due to wanting to be as green as possible, as well as, keep our utility costs reasonable. Assisted Listening Devices are available. There is a lift from the first floor to the sanctuary which is located on the second floor. Greeters will be glad to help make your visit comfortable and enjoyable in any way. The Unitarian Church of Underwood is affiliated with the Unitarian Universalist Association and MidAmerica Region. We bid you welcome, who come with weary spirit seeking rest. Who come with troubles that are too much for you. Who come hurt and afraid. We bid you welcome, who come with hope in your heart. Who come with anticipation in your step, who come proud and joyous. We bid you welcome, who are seekers of a new faith. Who come to probe and explore. Who come to learn. We bid you welcome, who enter this hall as a homecoming. Who have found here room for your spirit. Who find in this people a family. Whoever you are, whatever you are, wherever you are on your journey, we bid you welcome.